Are watching the second round of movies on the new DVD players. They also got Zhu Zhu pets today for their fantastic report cards. It feels a little weird to slow down. This slower pace will take some getting use to. Tom is doing a great job driving. Over the weekend I visited our local WalMart and bought two 7 inch DVD players for the girls – Happily there was a lot of selection and they have come down in price dramatically since last time I shopped for this type of item. The dual-screen setup I bought from Canadian Tire some 4 years ago is ailing and only one screen works at all. Now when they want, the girls can each watch a different movie and plug in headphones…so listening to Disney or Barbie will now be optional for us adults! Since they have their entertainment, we decided yesterday to leave the TV behind completely. It and the DVD player take up almost 2 complete overhead compartments….and we need the space. Anyway, we only have analog TV reception in the RV, and with the USA being 100% digital now, there’s nothing to tune into for us anyway. I suppose it’s time to upgrade sometime soon…but for now, between reading material and two laptops, Sunita and I have plenty to entertain us. The Countdown Continues...Plus New Glasses! something...just hope it's nothing crucial! It's "T minus 9" days to departure. I'm sort of ready from a packing perspective but the devil is in the details. I worry I'm going to forget something important. I need to get Sophia's puffer renewed because it's expired and she might need it on the trip -especially at the high altitudes. This requires a yet unmade appointment with the family doctor and fitting that into a work schedule. I should put together a list of their previous medications in case they need antibiotics while we're away and the doctor want's to know their last prescriptions. I have not given a thought to what meals we need those first few days because I should take enough groceries with us as we're on a pretty heavy driving schedule the first 4 days. The key item to avoid as we know from the last trip through customs is anything citrus. I remembered this last weekend on the QEW, just a few kilometers from the Queenston-Lewiston Bridge at Niagara Falls, and hence a lime went flying out of our RV into the bushes by the roadside. Hopefully no animals were hurt in this process. Besides food and medicines there is the clothing for 2 months for 4 people, ranging from bathing suits to full-on winter apparel for Yellowstone and all assorted shoe wear. Lately I went on a great shopping spree at Scholar's Choice buying everything from workbooks to multiplications times table chart (goal is to get Jessica to learn as least the 1x12 to 5x12 tables), to arts and craft stuff. I ended up splurging on a fantastic Princess Playmobil toy set that I can't wait to play with, never mind the girls. These items are hidden away and will appear at opportune times on the drive when I 'm about to lose my mind if they start saying "When are we going to get there" and it's mile 559 out of 14,000. On this past weekend, we were at Camp and checking that we had sufficient cash to get to George Karpouzis' Coolest Little Ice Cream Shop for ice cream. I mentioned to Sophia that money was important for this. She looked at me and said "Mommy, money is not important. Money is important if you're fine. But if you're not fine then money isn't important". I was utterly blown away by the innate wisdom of these words. It makes me realize even more that Tom and I could not have made a better decision than to make ends meet and made this trip happen this summer ...while we're all still fine. Our RV is a 28 ft. Triple E Regency, which is built in Winkler, Manitoba on a 2000 Ford E-450 Chassis with a 7.3L Powerstroke Diesel - the best diesel motor ever made! Our TOAD is a 3500 lb. 2009 Honda CR-V, equipped with Blue Ox base plates and a 10,000 lb. rated Aventa LX tow bar. It’s taken us much of the winter and spring to completely finalize our route for the coming two months. We did some adjustments as late as last week to accommodate a side-trip to SMI Brake near Evansville, Indiana to have their Stay-IN-Play Duo system installed on our Honda. Since the CR-V we tow is right on the weight limit of our RV, we are apprehensive about towing without brakes, particularly as we cross the Rockies twice during our trip. Since we typically take our time and leave plenty of space ahead, we're less concerned about the braking power of our rig as much as we are thinking about the potential legal/liability issues. Towing laws have gotten much more stringent in the past 10 years. 8. Next up is Redwood National Forest in northern California, where we will spend 5 nights boondocking. 9. We then plan to spend a week at the San Francisco KOA. 10. Yosemite National Park, California - once again without hookups. There are plenty of gaps in our schedule and often we have 2 to 4 days between stops so we have plenty of time to explore and we aren't having to hurry - or have long driving days. The longest driving days will be the two days after we leave Indiana at the start of our trip. We actually have no confirmed plans after Las Vegas, but have about 2.5 weeks to get home, so we'll see where we feel like going on our way northward. 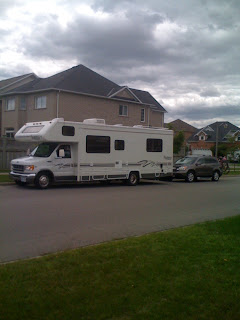 We have traded sites with our new friends Daryl & Michael, and so today we moved the RV out of our seasonal site and into an RV storage yard near our home. Once they close the sale of their condo, Daryl & Michael will spend the month of July on our site at Cedar Beach. Since it was the last day we would have full hookups, Sunita cleaned the interior from top to bottom in preparation for the start of our trip. I packed up all the exterior compartments and cleaned off all the bugs from last week’s trip to Camping World in Churchville, NY. I’ve also unloaded a LOT of unnecessary “stuff” out of the RV to try and save some weight – there’s no sense in hauling gear to California that we won’t use. Once Sunita was done inside, I dumped the tanks. Will fill the fresh water to the top the day before we leave since we will have 3 nights of boondocking before we arrive in South Dakota, where we will once again have full RV hookups and be able to dump our tanks and recharge our batteries. Apart from a final exterior wash, the only things left to do are to load clothes and food! I've been considering blogging our upcoming summer vacation for a while, but a couple things helped convince me. First, after meeting Daryl & Michael at Camping World in Churchville, NY over the May 24 long weekend, I read Daryl's blog from end-to-end in one sitting. Daryl & Michael, who also call Pickering home (at least for now), are in the process of selling their home and many possessions to live on the road in their Triple E Regal. To RV fulltime after retirement is a dream of ours as well. We'll certainly follow their travels.